We took the red-eye flight there, only a few days after our last event in Los Angeles, driving from the airport straight to our first hike.That night, we went to bed on the west coast of Iceland, over 36 hours after waking up in New York, with steam rising in patches from the mountain just outside our windows. We were there for only two nights, but managed to fit in several hikes, seeing countless waterfalls, black sand beaches and surreal rock formations. We tasted naturally carbonated mineral water, slogged through a muddy marsh to our first natural hot spring, peered over the edge of a volcanic crater, and nearly swam through the sulfuric fog surrounding our second hot spring (which happened to be only a few hours before our flight home, and we had forgotten towels). But the snapshot everyone had been so frantically texting me about all of last week depicted my parents attempting to scale a nearly vertical wall of ice. This happened to be one of the highlights of our trip, and like all the best stories, was very much unplanned. I had climbed this particular gorge over the summer, finding a beautifully serene cave leading to a hidden waterfall. This time, we encountered a very different scene. The glacial waterfall had not only frozen over but completely filled the cave. 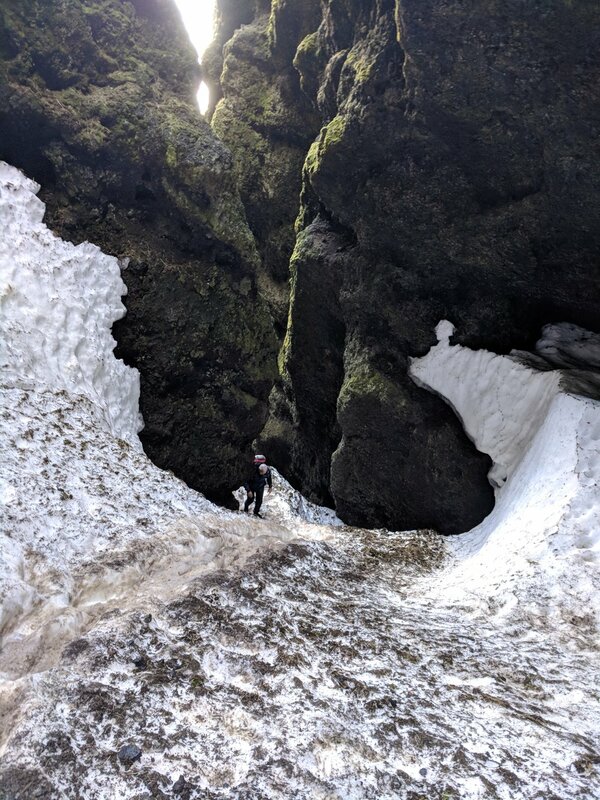 Rather than turn around when greeted with the solid wall of ice, we simply strapped on our crampons and proceeded to climb up, knocking footholds into the extremely slippery surface on our way up. It was sometimes terrifying, but ended up being one of the most incredible things we had ever experienced. So just to sum things up for all concerned parties, my mother was NOT in any danger, she climbed up the waterfall of her own free will (although I’m sure she regretted it at a certain point), and she had the time of her life. Decide for yourself- take a look at some of our photos below!